Demand was great, sales were huge and HP wants more. Posted August 31st, 2011 by Karl & filed under Technology. Yesterday HP announced that they will be releasing a new wave of their webOS TouchPads to the masses in order to meet the unexpected high demand for the product since the price drop. 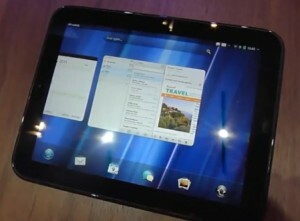 According to HP’s official blog, they’re planning on producing one last run of their webOS tablet product to meet the unfulfilled demand from the previous batch. This comes after they had received an unprecedented amount of requests for the product on their website. Perhaps quite interestingly, the future of the webOS tab is unknown as different sources seem to depict a different picture. With TechCrunch and the L.A. Times reporting that HP could resurrect the product at a later date, HP’s official blog have re-iterated that the manufacturing of the webOS hardware has come to an end. Mind, this was reported by HP a day prior to that of the former two and with the demand at the level it is, it wouldn’t be at all surprising to see the webOS make a return. High sales creates a high audience, which in turn brings huge scope for successful app development. HP are, however, making a heavy loss with the sale of each TouchPad, as the parts for the TouchPad itself can cost around $318. However, I imagine HP see this not just as a way to shift the failing products from the warehouse, but also as a way to boost it’s presence in the technology field with PC sales also starting to dip through the boom that Apple have seen in the last few years. It will be interesting to see how the demand and sales of the supposed final wave of HP tablet will effect future development. According to mobiledia, HP still plan to continue software updates for the webOS tablet despite announcing they are discontinuing the product line. Another unexpected development on the TouchPad saga is the sales and price of the TouchPad on eBay, with The Guardian touting prices in excess of $200 and TechCrunch suggesting they’re being sold for closer to $300 per tablet. What HP would give to have sold them at that price prior to the price drop! HP Blog “The Next Bench” – More TouchPads on the Way. Techradar – HP TouchPad UK price drop to £89 confirmed at Dixons. TechCrunch – HP discovers the wonderful power of scarcity, and the TouchPad lives on. L.A. Times – HP Executive: The TouchPad could be resurrected. The Guardian – TouchPads, HP says ‘one last batch and that’s it’. The Guardian – HP’s problem with PC’s, explained in three graphs. Mobiledia – HP TouchPad gets second life, software updates.